Here’s a sobering statistic: 1 out of every 6 adult Canadians will declare bankruptcy or file a consumer proposal. How is that possible? 2017 UPDATE: This post was originally written in 2012. 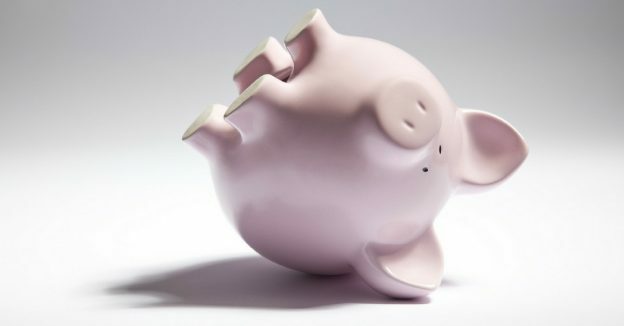 Even though consumer insolvencies have fallen to a lower than normal level of around 125,000 today, this number is very likely to rise in the coming years. Consumer insolvencies in Canada have be driven to unusually low levels in recent years due to sustained low interest rates and high real estate prices. 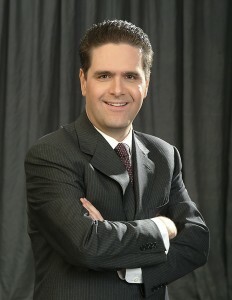 Interest rates are already rising and real estate prices in many markets are declining. For this reason I expect annual insolvencies to rise dramatically in the coming year or two. For this reason, the overall analysis in this post still holds today. According to the Office of the Superintendent of Bankruptcy, in Canada each year there are between 130,000 to 150,000 Canadians who declare bankruptcy or file a consumer proposal. Projecting forward, over the next 30 years, assuming bankruptcy and population rates remain stable, that means that approximately 4.5 million Canadians will file a consumer proposal or declare bankruptcy. According to Statistics Canada, the adult population of Canada is just over 26 million people. 4.5 million insolvency filings divided by 26 million people is an insolvency rate of 17%, or more than 1 in 6 Canadians. And yes, I realize that if you projected more than 30 years into the future the number would be even higher, but if you didn’t double count the people who file a second bankruptcy the number would be reduced, but as a rough estimate 1 in 6 is probably fairly close to the true insolvency rate in Canada. As I have said before, excessive levels of debt leads to bankruptcy in Canada. I’m not the only one who thinks we have too much debt. The Bank of Canada, in a report released in early 2012 explains the trends in household debt in Canada, and the trends are clear: debt is going up. It’s not just debt; our debt to income ratio has increased over the last thirty years. Why? Because low interest rates have encouraged us to buy more big ticket items like cars and houses with debt. Debt has helped our economy grow. The housing boom of the 1990’s and the early 2000’s was fueled by low interest rates, which is great as long as you have a good job and can keep up with your debt payments. However, if you lose your job, or get sick and can’t work, or if you get separated or divorced and your circumstances change, debt becomes a very big problem. Don’t believe me? Just gather up 5 of your friends and ask them, because one of your group is statistically likely to become insolvent. That’s the math. If you don’t want to be a victim of the math, take steps to reduce your debt now. If you are already in over your head, and if you think you will be that one person out of six, there’s no point in prolonging the agony; talk to an expert and review your options. The adult cohort does not stay stable over 30 years. There are approximately one million Canadians entering adulthood, immigrating as adults or dying as adults every year. You need to factor this fact into your 1/6 Canadian statistics. In 30 years that is 30 million adults who are not the same as you are using in your stat here. 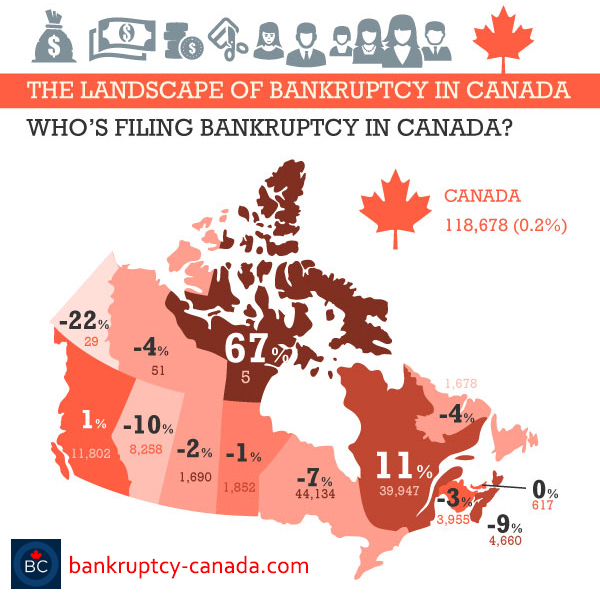 So 4.5 million insolvencies – 15% of which are the same same people declaring bankruptcy a second time – http://bankruptcy-canada.com/bankruptcy-blog/second-time-bankruptcy-rules-apply/. So we actually have 3,780,000 million bankruptcies – subtracting the additional 1% declaring for a third or more time. Divided by 56 million people and I get 6.75% not 17%? Still high perhaps not as alarming. You are correct that the “1 in 6” statistic is, at best, a rough approximation. It is possible that over the next 30 years, if our debt levels continue to increase, that number could be even higher. It is also possible that as the baby boomers age the number will drop. Increasing life spans may also play a factor, as we are observing an increasing number of seniors filing bankruptcy in Canada. Regardless of how you crunch the numbers, we still have a high bankruptcy rate in Canada.